When he was seven years old, his maternal grandfather died with his head in Osho’s lap as they traveled in the back of a bullock cart on the long journey to reach the nearest doctor. This had a profound effect on his inner life, provoking in him a determination to discover that which is deathless. “I learned much in that moment of his silence…,” Osho said later. “I started on a new search, a new pilgrimage.” This, and other stories in Glimpses of a Golden Childhood, give rich insight into Osho’s early years, and the innocent spirit of the flame of rebellion and playfulness he brought to every endeavor in his life. 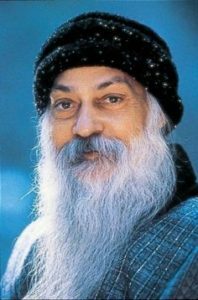 For more than thirty-five years Osho worked directly with people who came to him, sharing his vision of a “New Man” and inspiring them to experiment with a life based in meditation. Bridging the ancient truths of simpler times with the current reality of man, he created numerous meditation techniques, which give seekers an avenue to experience the ultimate. Seeing that the complexities of life needed to be addressed, he worked closely with many prominent therapists from the West to create new therapies based in meditation.